A little late on Featured Friday, but it took me a few days to get back into our routine now that we're back in Dallas. And it doesn't help when the memory on Firefox is on someone else's computer in another country so you can't exactly go back and find the things you wanted to link to easily! 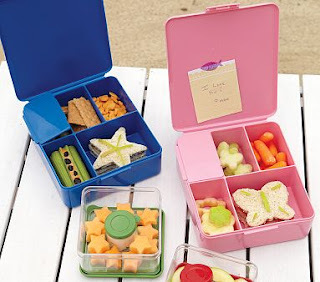 I love these bento style boxes from Pottery Barn Kids! Rainbow meals and kid choices from In the Kitchen with Audrey are just wonderful. 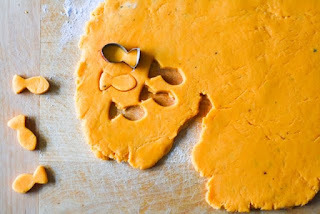 How awesome are homemade goldfish crackers??? 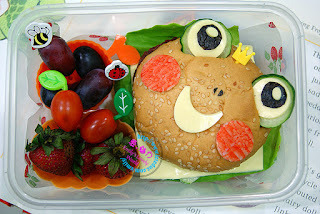 This King Frog bento from Emily's Lovely World is adorable! F&B love froggies, I'm going to have to try this! I was just thinking about those Pottery Barn ones. Are they capable of keeping something like applesauce or yogurt contained in that little area with the lid? And I LOVE the dip ones. So convenient!! Love the fruit and dip containers from Pottery Barn. And love your Featured Fridays. Thanks!